Jim Hafner, Land For Good’s Executive Director, welcomes Chris Beyerhelm, Acting Administrator, Farm Service Agency, USDA. Neil Hamilton, Drake University Agricultural Law Center, offers opening remarks on how land tenure shapes the future of US agriculture. Savi Horne, Land Loss Prevention Project, talks about legacy of African Americans in relation to farm & ranch land tenure. Gary Matteson, Farm Credit, discusses some of the many paths to land ownership. 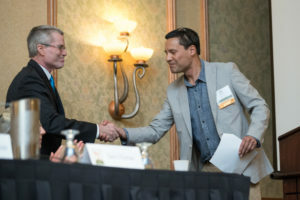 Over 220 attendees from 40 states contemplated difficult questions, and shared their expertise, experiences and perspectives in Denver, Colorado this past June 13-15. 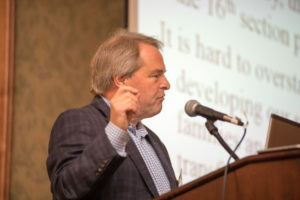 In over 50 sessions in six tracks, we tackled questions such as those raised by Neil Hamilton, Drake University Agricultural Law Center, in his opening plenary statement. Who owns the land? Who farms it? How is it farmed? And who benefits? In the Seekers and Land Access track, we examined seekers’ land access needs, financing, the role of easements, and the intricacies of leasing. We debated land ownership as a policy objective. 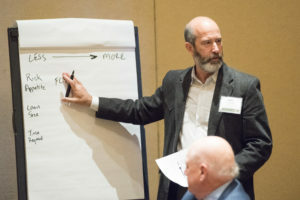 The Succession and Transfer track looked at building succession advisor teams, farmers without successors, and connecting transition planning with farm programs, for example. Non-operator Landowners’ (NOLO) characteristics and needs were explored in that track, including public lands, women on the land, and connecting NOLOs and seekers. In the Non-traditional Approaches track, attendees grappled with shared ownership and farmland investor models, new partners, and the role of incubators and community planning in land access. 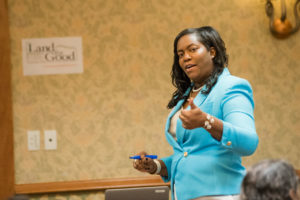 The “Focus On…” track addressed urban land access, systemic prejudice, heir property, land and water rights, access issues for military veterans, industry perspectives on land tenure, and the role of farm advocates, among other vital topics. Intensive roundtable sessions enabled participants to dive into policy and research agendas, “new agrarian” views on land tenure, and farm link programs, among other topics. At the farmer plenary panel, next generation producers from California, Colorado and Rhode Island shared their inspiring stories. 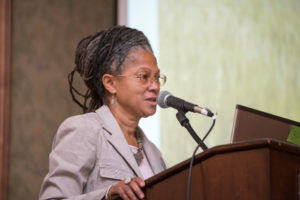 Shirley Sherrod, noted for her lifelong work with Black farmers, shared the plenary stage to discuss racial equity challenges in agricultural land tenure. With so much content to digest, attendees spent the last morning in regional breakout sessions inventorying regional characteristics, needs, strengths and gaps. LFG thanks over 80 presenters, along with the session scribes and volunteer videographers, for their indispensable contributions. A special note of gratitude to the conference Planning Team (listed below), the Colorado Host Committee (listed below), and Colorado Agriculture Commissioner Don Brown. This national event would not have been possible without our sponsors Farm Credit, Cedar Tree Foundation, International Farm Transition Network, Rocky Mountain Farmers Union, American Farmland Trust, Drake University Law School, Farm Aid, USDA National Institute of Food and Agriculture, Sustainable Agriculture Research & Education, and the National Farmers Union to whom we owe our sincere gratitude. Attendees’ collected wisdom will be shared in a compendium of successful and innovative practices, programs and policies. LFG is inspired to pull this together. Stay tuned! Additional support provided by a grant from the USDA National Institute of Food and Agriculture through its Beginning Farmer and Rancher Development Program, #2015-70017-23900.